OXID eXchange | Amazon Pay 3.2.2 | Stable | EE, PE | 4.10.x/5.3.x - 6.1.x - pe | Module, Themes, Language Packs direkt herunterladen! Pay with Amazon (Amazon Pay) enables you to offer your customers a seamless, fast, convenient and secure purchasing experience; so you can help lift basket conversion, acquire new customers and turn browsers into buyers on your OXID shop. Included in core as of OXID 6! A ‘Login with Amazon’ module that allows customers to seamlessly register and log in using their Amazon account credentials. A payments module ‘Pay with Amazon’ that allows customers to complete the checkout using the payment methods stored in their Amazon account. Your customers save time and hassle by using their Amazon credentials to login and pay; so you increase repeat buyers by offering a trusted and convenient payment method. Your customers won’t leave your website to login or enter their payment/shipping information; so you capture sales from buyers who are reluctant to enter their information. You will need to create an Amazon Payments Seller Account to use the Pay with Amazon for OXID eShop extension. This account is where you will receive payments, update your account settings and view settlement reports. 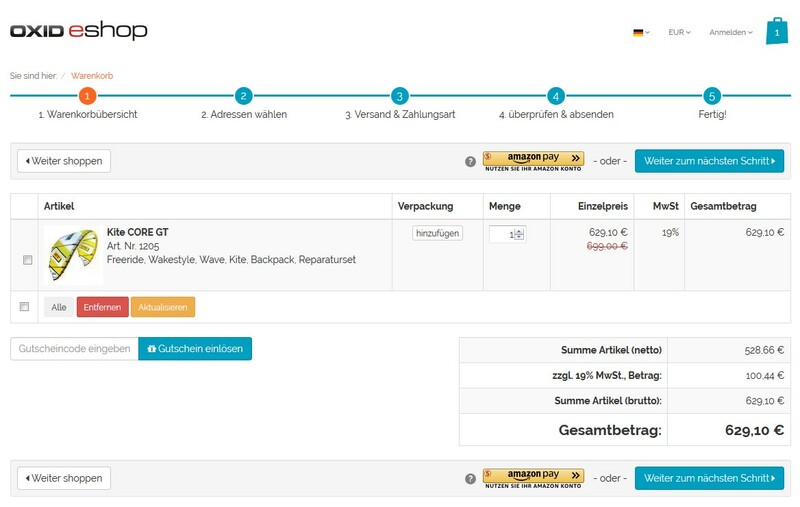 For online merchants from Germany, please register here.